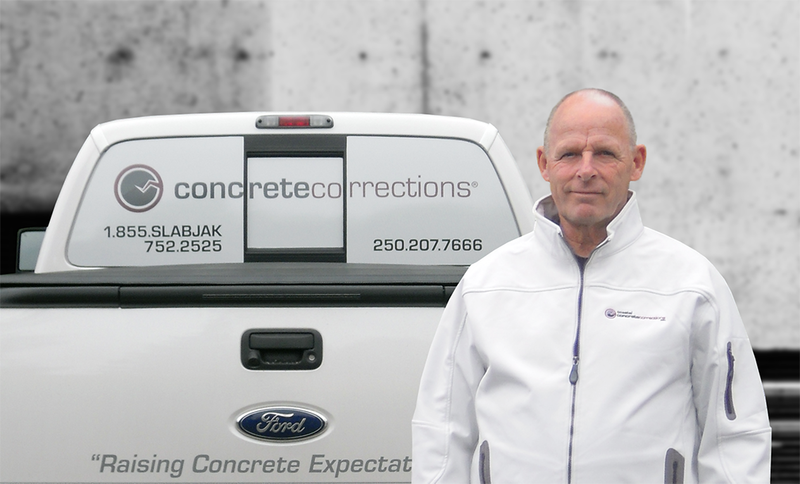 Vancouver Island’s concrete renovation organization. We have offices in both Victoria, BC and Courtenay, BC and service all of Vancouver Island and the Gulf Islands including Nanaimo, BC. We perform all aspects of concrete care and concrete restoration such as cleaning, sealing, colouring, crack repair and slab jacking for homeowners. Our commercial and industrial services include: fixing leaking foundations, parking slabs and leaking water reservoirs employing our flexible grout injection system. We fix all kinds of floating slabs in warehouses and do a lot of trip/fall hazard removal, minimizing liability risks to commercial property owners. Our slab jacking services are minimally invasive with almost no disruption to your daily business operations. If you are looking for a reliable, honest service to resolve your concrete challenges call us for a free estimate. If we can’t help you personally, we will still try and find a solution that will solve your problems. Matt and Mike just completed slab jacking and repairs to our front stairs and patio. Both had settled by approximately 3 inches. Before contracting with Matt I met with 2 people who had similar work done 3 years ago. There had been no further settling and it was very difficult to see the joints or holes that had been drilled. Matt has done the same outstanding work for us. They went way beyond the work we initially agreed on at no extra cost and they did a great job of site clean up. The detail they went to in blending the stones was almost artistic. Hi Matt, We just wanted to say thanks again for your workmanship and attention to detail in the completion of repairs to our garage floor. You and your team were prompt and efficient throughout the project and we were particularly impressed with your quick follow up when we perceived that there might be a problem after the fact. Based on our customer service experience and the excellent results you were able to achieve in the levelling of our floor, we will have no hesitation to refer others who may have the need for similar “concrete corrections”. Hi Matt, Thought I’d drop you a line before I go to bed. I hadn’t looked at the amount you were charging until a while after you had gone. I just automatically assumed that it would be a bit over three thousand ($3,000). When you told me that it would be under that amount, I thought you meant before taxes. I was absolutely delighted to see how you had kept your costs down. Couldn’t have asked for a better job or a better price, so thank you so much for everything. Dear Matt, This is the second time we have hired you and again you delivered! The job was done in a timely fashion (as much as the weather allowed ) and your worker, Ben, put in the extra time it took to get the driveway as clean as absolutely possible. Due to that we have had compliments from the neighbors. One thing we like is the quality you insist on and a positive work ethic for yourself and crew…punctual, a forward thinker…always considering if the things being moved should be sitting on the grass or what the weather is doing. You are worth every penny!! Many thanks to you and Paul for doing a great job! It seemed no one could or wanted to do the job and they all offered us expensive alternatives, so I’m so glad to have found you! The manner in which you dealt with it was reassuring, prompt, kind and professional. Thank you for the excellent service and outstanding workmanship, and going above and beyond expectations, for the repairs to the patio cement deck and garage side walk. Your attention to detail and quality of repairs is beyond what we were expecting to the severely damaged patio cement. There’s no doubt that you have saved us a tremendous amount of money by repairing the cement patio and sidewalk instead of having to replace both pieces, I look forward to having you come back next year and complete the driveway. Again many thanks for taking time to come and address my concern. We had a good conversation and appreciate your knowledge on the subject…garage floor sinking. I showed my wife what you showed me and we will be watching those areas from here on in. As silly as it sounds, a lot of stress was relieved just by you having a look and educating me. Excellent customer service. Coastal Concrete Corrections Inc. slab jacked our badly settled and cracked front walkway and driveway this summer. On first contact and throughout the project we found them exceptionally reliable with all calls and emails returned promptly. Their work was meticulous and impressive and we have had many compliments regarding the results. During the project they were exceptionally courteous, arriving early to prepare for the day’s work but not starting the process until well after 9 AM – out of respect for our elderly neighbors. Simply put they did an excellent job and went well beyond our expectations. I called Matt Neil of Concrete Corrections in desperation when it appeared one corner of my rental duplex was shifting lower. I had had a Geotech survey and a land survey done as well as spoken to someone who repairs these kinds of problems who didn’t think he could help me. Thankfully he gave me Matt’s contact information. After my first phone call with Matt I started to feel less anxious about the problem because he sounded so knowledgable. He told me he would drive from Courtney to Nanaimo to look at the duplex (which he did within the week) and if he couldn’t fix it he would help me figure out what needed to be done. He not only went into my duplex but spoke to the contractor I had had do a renovation a couple of years ago to see if he could determine exactly what had happened. His conclusion was that I needed to do several small things and observe the situation but I didn’t need his services at this time. I wanted to at least pay him for the time he took driving to Nanaimo and looking at my problem but he wouldn’t accept any payment. I can wholeheartedly recommend Matt as an honest businessman who is really interested in customer satisfaction and finding the right solution to the problem even if it means he doesn’t get the job. Thanks so much for the excellent work on my garage floor and driveway. I have appreciated the way you do business from the first time I called to enquire about having this overdue project completed. The way you kept in touch to set up a time to start the project was very helpful, assuring me that my project was important to you. While on the job your dedication to quality workmanship was impressive. Your commitment to completing the job without delay and the skill in matching the filling of the cracks in the driveway with the colour of the surrounding concrete is truly artistic. I wouldn’t hesitate recommending you to anyone interested in using your services.